My Friday night was a good sewing night, as soon as dinner was over I got my stitching set up. I am working on a new table runner that I designed. It has little flowers stitched throughout and I used my beautiful Tilda fabrics that I have been hoarding. I remember watching a tv show once about a poor family and they received some beautiful china, that night at dinner the mum used the china and the kids were amazed. Mum said " why have beautiful things if you can't use them" Well thats how I feel about some of my fabrics, why keep them in the cupboard when you can make them into a beautiful quilt. While we are chatting about beautiful things I have to share some beautiful blooms in my garden right now. The anemones are pretty but the crab apple blossoms are AMAZING. Look how pretty they are. I wish they stayed like that all year round. My husband always gets worried when I say " I have an idea " Well he actually liked this one, I wanted a new garden built int he back corner of the yard with a little seating area, so this is what we came up with it. 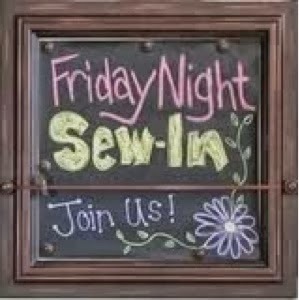 Its going to be a glorious day, if you would like to see what other ladies got up with their sewing pop over here and check them out. Thankyou Wendy for hosting. Gorgeous fabric choice... and what a beautiful place to sit and perhaps place a stitch or two in that gorgeous fabric! EnJoy the upcoming blooming season. Your Tilda quilts looks great. Tilda some how pulls at your heart strings. Great seat and garden idea. It will be lovely to sit in amongst the flowers. I love coming to visit in your garden. That seat looks like a nice place to sit and stitch or read. Love your quilt you are making. The runner looks very pretty! Can't wait to see what the lovely seating area looks like when all those flowers come up. it's always like Spring when I visit here- whether it is your glorious garden or your delightful stitching! Personally the anemones are my favourite- the colours are amazing! Hi Leanne - oh I should do that more - get out my beloved precious fabrics & make something with them to show them off, rather than hoarding them... lovely projects there, the Halloween one looks interesting. Love your Tilda and the garden looks great.. Your table runner is looking great..
Lovely new sitting area and I hope you post when all the seeds come up and flower. O Leanne, it's striking how we have the same taste and ideas often. I love your new corner in the garden, I also have one like this, it only needs to be made a little bigger and longer. Now we are building a new shed for the bycicles and then we will do that corner. We have such a good husbands, don't we?! I like to see your flowers all around in summer. The Tilda table runner is beautiful. Love the start of your runner! I like your new garden area, and hope to see it brimming with flowering plants before long. Spring has sprung! Your table runner is going to be beautiful, Leanne. Just love your Tilda project. Your table runner looks so pretty and your garden looks amazing, I love your new idea for it. A wonderful post. I love your quilt blocks and I like the added touch of hand embroidery. Your stitching is nice. That is what I want to do on a future quilt. Beautiful fabric and the colors are beautiful. I like the way you also fussy cut some of the fabric for the centers. Yes I agree about hoarding. I know it is hard to cut into beautiful fabric and paper too. But it will be more enjoyed into a finished project then in a cupboard or container. Love what your husband is doing with your sitting area. The small steps are great. What beautiful crabapple blossoms. I like flowers that bloom in clusters. What pretty anemones. They remind me of poppies. Wow, your garden is have a wonderful start to Spring. It is our first day of Fall here. Much cooler weather too. Yah! have a wonderful day and the rest of your week.